After my last video I received a bunch of messages asking me to cover Java Arrays. So in this video I go over everything you’d ever want to know about Java Arrays. I show you how to create arrays, numerous ways to populate them, tricks involving multidimensional arrays, the enhanced for loop, Array library methods and more. 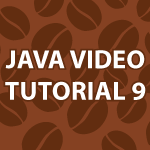 If you missed part 1 of this series check it out first here Java Video Tutorial. Like always heavily commented code follows the video. Yes j is being﻿ assigned a temporary index from 0 to the last index in the array named numberArray. It is basically there to serve as a title bar listing of columns from 0 to 9. It doesn’t serve any other purpose. Thinking back, I didn’t love this example and I much improved on this tutorial as I progressed into part 11 and then on. Ah, I sort of figured out something was a bit wrong there. Could you please edit it? Or atleast add a comment saying you’re just adding a mock value? Because this could be extremely misleading. Thanks, and nice tutorials. I am using notepad++ to execute the java programs. I have two class files and i am trying to access methods in second files in the first file but I am getting error saying class not found. can you please suggest what I am missing here. it’s been a long time since i have worked on java. I am coming back to it after working on c++ for many years, and your videos are just perfect way for me to revise everything in no time ! Moreover, I would appreciate a lot if you can arrange a tutorial on how to debug java code in eclipse. Something like using breakpoints, how to start a java process while debugging .. !! It would be of great help ! How do i display ‘for all’ quantifier character inverted A of math in java? For all n belongs N …. This constructor type syntax, makes me ask, if int is class? Makes me ask, if int is primitive type? I’m sorry but I don’t understand the first question. As per the second yes ints are primitive types and not objects. Sorry about the confusion. Would you have an example of a character array? For instance if I had the user enter their name in a dialog box, and that data comes in as a string. That data will have to be converted to store the letter in a character array. Do you have any examples like that? Just wonder, how I can code copied form here without the line tags? Thank you 🙂 If you put your mouse over the top right edge and click View Source you can eliminate the line numbers. Sorry about that. Thank you 🙂 I’m glad you enjoy them. At the very end of the Java tutorial I actually make the game Asteroids. Much of what you need to know about games are covered there and translate into developing Android games. As per what Java you need to know for Android, you need to understand parts 1 through 18 minus tutorials 8 and 10. You also should watch my Java MVC tutorial. You will better understand OOP with the first 2 parts of my Java design patterns tutorials.